Who said that only good children, who are obedient all year round, deserve presents from Santa? The naughty ones, like these three cheeky mice, surely deserve some treats too. Otherwise, they will sneak up the Christmas tree at night and steal all presents from the mittens. If you have children who are as restless, fun, and unmanageable as these three little rascals, then you might like the idea of embellishing their winter holiday clothing (sweaters, hats, mittens, scarves, and jackets) with this charming piece of needlecraft. 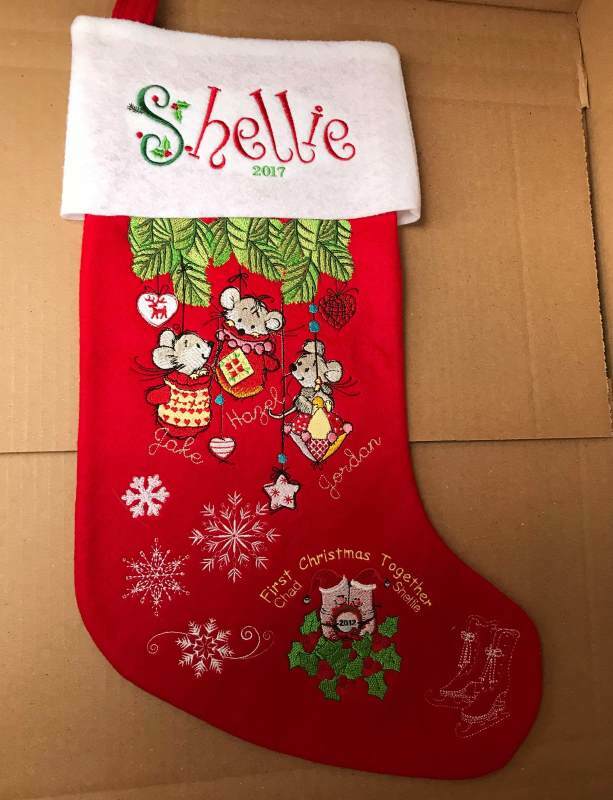 They will surely love it because this is arguably the cutest embroidery design out of the entire Christmas collection. Super cute design stitched out great. Beautiful on tablecloth! Do you have this Christmas mice smaller than the nearly 4 x 4 inch? I need one no taller than 2 inches and I didn't find one. Or, can you tell me the name of a calligraphy font that has the I as in the your free designs? Not possible. This is very small size. We using Watermelon font. I need to resize and I don't see where I can do that here. That's why I've been purchasing elsewhere. 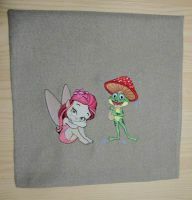 All designs have full informaion about size, stitches and colors. You check it? What embroidery machine you have? You hoop size? what size you need? It's ok. A friend turned me on to truesizer, I can reduce them now. Works wonderful with my Brother 2200 machine. Stitched out great! Love it! I think design is really nice and have used it shortly after receiving it. I used it on some Christmas napkins I am gifting at Christmas. Look great on my new cushion. Thanks so much! The file was perfect and easy to use! Perfect for the project! Thank you! I sewed it on a pillow as a gift to my sister. Very nice mouse. Many thanks. Very beautiful design and even small elements are clearly visible. Maybe I use this design several times. Many thanks. Stitches out perfectly! easy download,Ssmall scale, so cute. Great design! 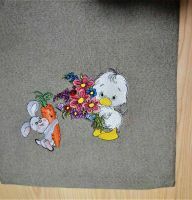 So precious can't wait for my grandson to see his new cushion. Thank you. Love it! In love with the Christmas mice! Used the pattern to decorate my kitchen towels but I think it's only the beginning. 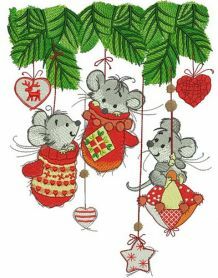 I'd embroider the mice on my Christmas gifts. Great design! 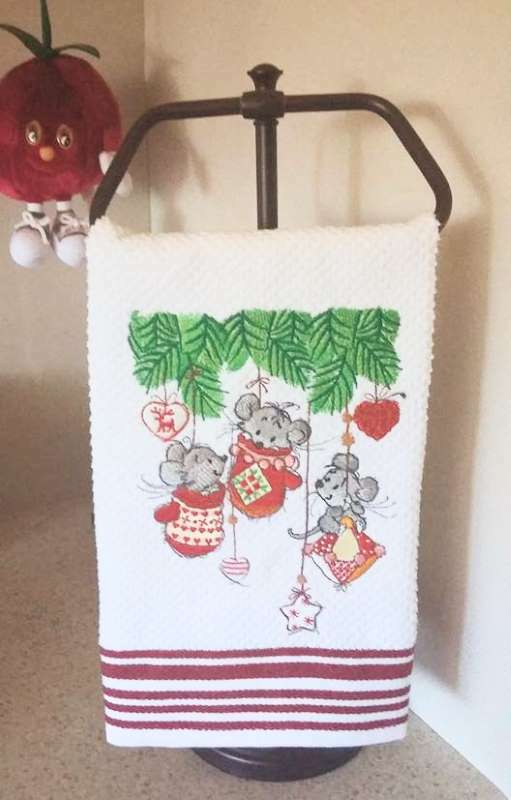 I was looking at the "Christmas mice" examples associated with the embroidery file of Mice, and one of the towels has the Snowmen from the forest embroidered with Bunnies. I love the Christmas theme... but could not find them available to purchase. This is customers work. Nowt available for sale. 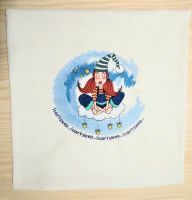 But you contact via our Facebook page with customers having embroidery machine. They can sew it for you. 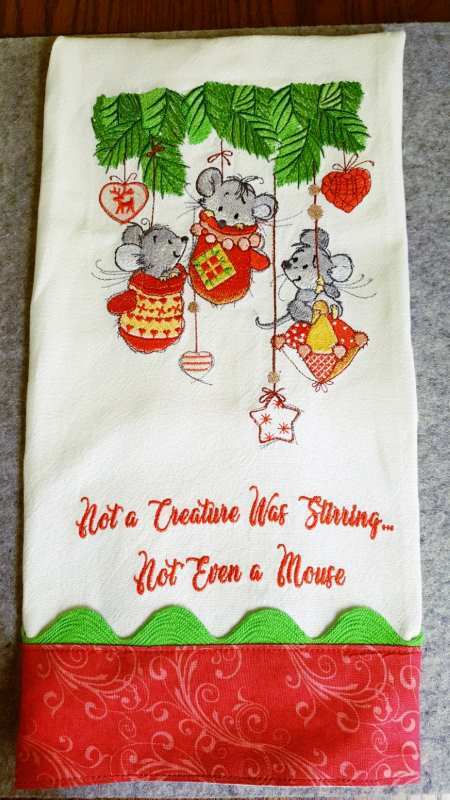 Where do I get the writing that says "Not a creature was stirring, not even a mouse"? Thanks to the designer for the wonderful Xmas pattern! 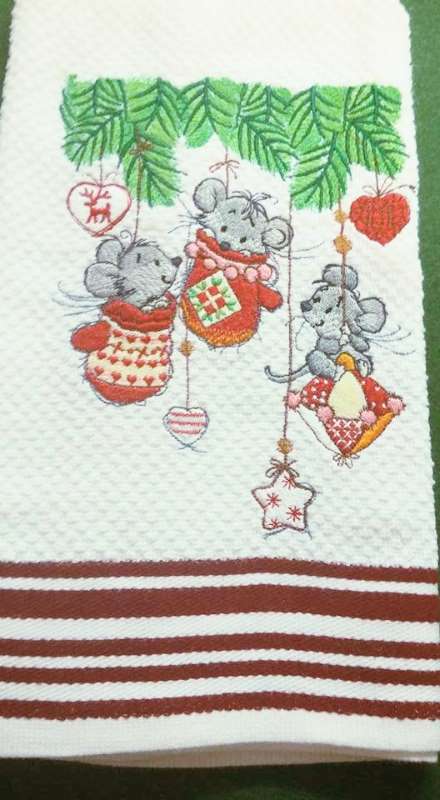 I decorated my napkins with the mice and it looks really great! So detailed and the price is cheap. I highly recommend the seller. wbocrafter: Please send request via Contact us form with many details. - Size...format..